Today, January 14, marks the death and martyrdom ofSaint Felix of Nola (born early third century, died 255). Born in Campania, Italy, Felix joined the clergy, giving all he had to the poor, shortly following the death of his father. Working under the guidance of Bishop Maximus of Nola, both underwent persecution and torture at the hands of Roman Emperor Decius. Shortly following the imprisonment of Bishop Maximus, Felix was taken into custody by Roman soldiers, imprisoned, scourged and tortured, and wrapped with heavy chains in his prison cell. He miraculously escaped from his cell, following visitation from an angel who instructed him to go to the aid of his ailing bishop. As the angel encouraged Felix, his chains fell off and his prison cell was opened. Felix rescued Maximus, bearing him on his back (despite weakness and small stature), and effectively hiding both men from Roman authorities until the end of Decius’ reign. The second attempt to imprison Felix and Maximus was miraculously prevented by a spider! 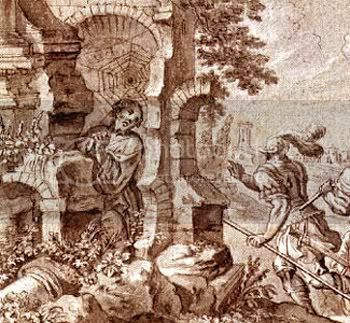 Upon hearing Roman soldiers approaching, Felix crawled into a small hole in the building he was staying, where it is said a spider immediately spun a web over the opening. The guards saw the spider web and ceased searching for the men, assuming that the room had been undisturbed for some time. Felix was a humble and giving servant of the Lord. 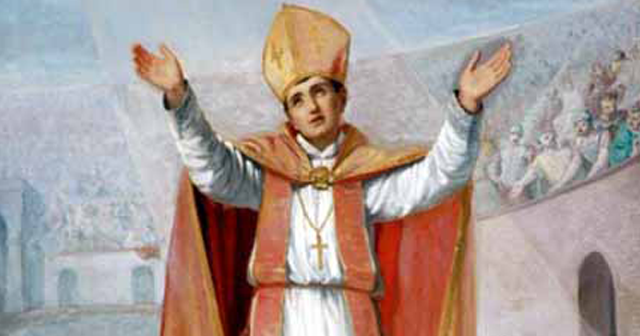 Following the death of Maximus, he was called to be the next Bishop of Nola, but refused, indicating that one of his more experienced brothers (ordained only seven days prior to Felix) was more deserving. He refused to reclaim his possessions and land seized during the persecution, instead renting a meager plot, tilling it by hand, and sharing his goods with the poorest around him. It is said that whatever Felix possessed, he gave away to those in need, oftentimes to his own detriment. He died in 255, and is considered a Church martyr due to the torture, imprisonment, persecution, and suffering he endured for his faith. Buried in Nola, numerous miracles have been reported at his tomb. Felix received a clear call to action from the angel in his prison cell, just as the Blessed Virgin received the Archangel Gabriel’s message of her extraordinary role in the Incarnation of Jesus. Felix heard the call, and risked his life and unimaginable suffering to answer it. While the messages we receive from the Lord are not always heralded by angels, we still need to listen for them—and perhaps listen all the more closely. These are the quiet urgings of our hearts, which bring us closer to our God. How often are we too busy and too wrapped up in our wants and needless anxieties to hear the call of God? Might slowing down and creating some silence in our lives enable a deeper communion with Christ? Today, we pray for that silence—the silence in which we hear and understand what the Lord wishes for us, and the courage to stand up and put the call into action! Very inspiring, I love this! What a faithful and humble servant of God, I'm so happy going through this story, I love it!